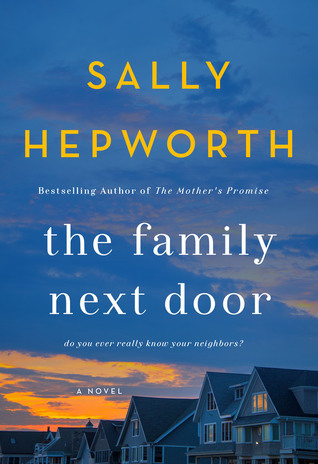 The Family Next Door, an excellent new book by Sally Hepworth, is about secrets, both those that we keep from our friends and neighbors but more importantly the secrets that we keep within our families. The author does an amazing job of giving us a great plot with people that we all feel like we know in our day to day lives. Pleasant Court is a small neighborhood and Essie, Fran and Ange all live in this small suburb with their families. They are all parents of small children and even though they all wave to each other and talk everyday chatter, they aren't really good friends. They all wonder why Isabelle decided to move there since she's a single woman with no kids. The story is told from all 4 woman's point of view and as they each tell their story, secrets are revealed in each family. Even though mistakes were made - some major - the more we learn about the characters, the more secrets they reveal. As their obsession with their new neighbor grows, the secrets of these three women begin to spread - and they'll soon find out that when you look at something too closely, you see things you never wanted to see. You never really know the secrets that someone else is keeping from the world. This book is about friendship and motherhood and secrets and is a great book by this author.